Mr Thomson’s mother restored the old schoolhouse in Blacklunans to be a holiday home. 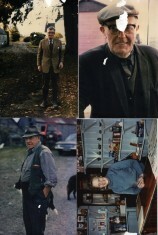 The 4 postcards were sent to the archive as one photo, as were the photos of 4 characters in the glen. Some of them have been expanded to show the original picture in the galleries section of the website.